All photos on this site are the property of their respective owners. Not for commercial use including, but not limited to: Internet auctions or web sites. 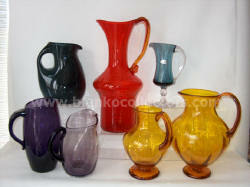 On this page, you will find items that are often mistaken for Blenko, copies, reproductions and outright fakes. Scroll down for other special features and fun 'Test your knowledge' pages. Is it Blenko? Click on a photo to see.